Please refer to our stock # im1 when inquiring. 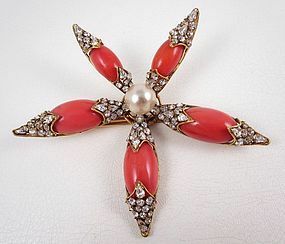 This sensational pin was designed by contemporary costume jeweler, Iradj Moini. It measures 4 1/2" in diameter and is handcrafted from antiqued brass wire with glass coral stones surrounding a center faux pearl. The stone caps are elaborately set with faceted crystal accents and the reverse is signed "Iradj Moini" on an applied plaque. It is in excellent condition.